This tutorial will show you how to draw a cartoon eyeball! Drawing a nice looking eye can be quite challenging! You must use all your talent to sketch accurate reflections, lightning effects and to keep an organic feeling to your creation! But if you manage to do it right, your characters like look more realistic and alive. And therefore, more appealing for your readers! Let's try to draw a nice eye in this six steps tutorial! First, draw a big and nice circle. It will be used to create the eyeball itself! Next, add two small circles inside the first one. They will illustrate both the iris and the pupil. Time to add some fine details to your eyeball! 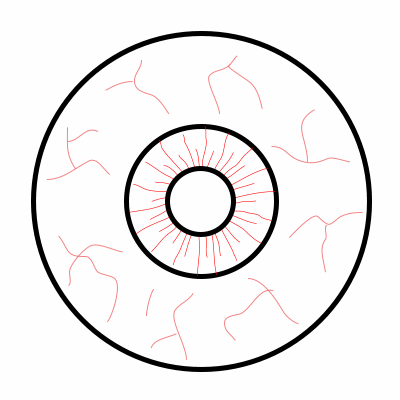 Inside the iris, sketch a couple of straight lines to give more texture to your drawing. When you are finished, you can add some nerves on the white part of the eyeball. To give a small 3D effect to your eye, you can also add a shadow and a reflection. The shadow in the bottom can cover a larger part and touched the outline of the eye. The reflection on top should be smaller and a little further from the outline of your eye. Add some basic colors to your illustration. In order to make the reflection more visible, add a light color (blue or grey) to the eyeball. Make the shadow on the bottom a little darker (but not too much!). For this last step, do the following to make the whole drawing more appealing: Add a small reflection on the iris (the little white circle on the top). Sketch a light shadow inside and outside the iris and finally, draw all nerves lighter and red. That's it! You now have a cool eye drawn with multiple basic effects! Nothing too complicated! I hope you had fun and learn something useful! Good luck!